Looking for a great way to spend a Saturday? Or any other day? Experience an adventure on Portland’s Famous 4T Trail Loop — where a trail, a tram, a trolley and a train combine for a one-of-a-kind, multi-modal way to enjoy Portland, Oregon, one of the nation’s most walkable cities! First, get your blood moving with a brisk hike uphill among the trees from the Oregon Zoo to Council Crest Park—at 1,073 feet, the highest point in the city—and then enjoy an easy stroll down to Oregon Health and Science University (OHSU), where you will board the Portland Aerial Tram and glide 3,300 linear feet downhill—in 3 minutes!—to the riverfront. From there, board the trolley (aka the Portland Streetcar) and ride to the heart of downtown Portland. Enjoy downtown’s shops, restaurants and food carts and then hop on the MAX light rail train back to the start to complete the loop. Or do it in reverse! Head over to Take a Hike! to get started with trail guides and tips, or to Directions to Trailheads for info on getting to the trail. 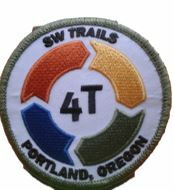 About for a detailed history of what it took to make the 4T possible, and Links for other trails, agencies, and city bureaus.